So you convinced the girl of your dreams to marry you in paradise, let’s make sure you’re wearing the appropriate groom beach wedding attire! Never fear, we have some suggestions that will knock the love of your life’s socks off 🙂 First, we want to congratulate you on making such an amazing decision to get married. Second, we want to help you look your perfect 10 for your wedding day! Making your bride happy on your wedding day is the very first step. A sure way to get her smiling is to rock the perfect groom beach wedding attire for you! We know this can be a daunting topic, so here are a few tips. A groom should complement the way his bride looks, and never clash styles. If she will be wearing a full gown, it’s a good idea for the groom to dress at the same level. A full tux isn’t necessary for a beach wedding, although it does look sharp. A simple vest and tie, or even a jacket with no tie are equally appropriate options! Keeping it casual for the beach, yet classy for your big day is key. The main thing to avoid is the groom wearing shorts and a T-shirt while your bride is wearing a $1000-$5000 dress, it just makes it look like the groom was forgotten about. Some grooms really need help in the clothing department and ladies you need to step in and help out if you want your man to look as good as you!! We know you want your wedding photos to look amazing and to do that your clothing must blend into a cohesive wedding look as a couple. This groom rocked a black tux for his Maui wedding! We love how it complements the bride’s formal wedding dress. Don’t they look like they stepped out of a magazine and onto the beach?! With a traditional Maile lei, this groom looks put together with just a jacket and no tie. If you aren’t sure which look to choose for your groom’s beach wedding attire considering the time of day is a helpful resource. Weddings during the day have the potential of warmer weather and tend to be a little more casual. Not too casual though, you’re still getting married 😉 . If this is the case, a vest over a button up shirt or simply paired with suspenders and rolled-up sleeves is a great option for a groom, you will look put together and stay cool. Win-win! This groom’s beach wedding attire is on point! 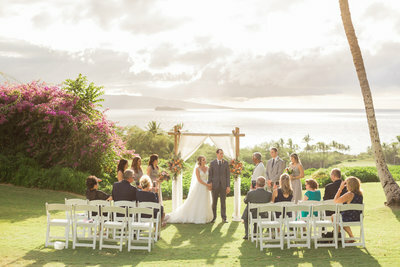 Suspenders and bow ties are a stylish and easy way to add color and class to any Maui Wedding. 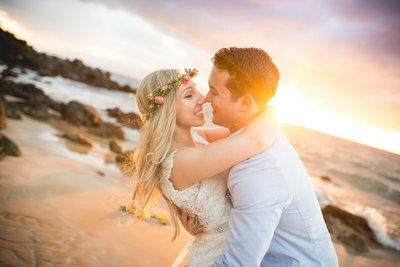 Maui has many beach locations as well as a variety of venue wedding options, each creating a special and unique vibe. To fit any setting, we always love when our groom’s wear three-piece suits to achieve all the best looks! It’s a nice idea for the groom to wear the jacket for the ceremony and then take it off for portraits afterward, but because of the heat it works better the other way around. If you wear your suit jacket during the ceremony, then your shirt is going to get all sweaty. This means you’ll either need to keep the jacket on or else your shirt will look all sweaty. We recommend keeping the jacket on! But if you just want to wear the jacket part-time then leave it off for the ceremony, when the sun is hottest and you’re at your most nervous. Then put it on for some portraits as the beach gets cooler 🙂 . We know you won over the love of your life with your stellar personality! We are always thrilled when that winning personality comes through in your groom beach wedding attire! Fun socks or a unique lining in a suit jacket is a great way to appropriately show off your style without stealing the show away from your bride. Find your perfect wedding look with this fun Groom Style Quiz by the Knot. The vibrant blue of this suit plus this fun festive lining is a perfect way to show personality without committing to too bold of a look for every photo. Little details go a long way! We’re always a fan of a good pocket square with a matching tie or bow tie, as seen here. We also applaud any opportunity for a groom to show his personality. We especially love how this groom chose to add fun socks for his special day. Did you know boutonnieres were designed to go into the buttonholes of a jacket’s lapel? This is a great great way to spruce up a suit and give the groom a floral touch. Plus if the boutonniere matches his bride’s bouquet, it also helps their wedding styling look cohesive. However, if the groom is just wearing a shirt, then it’s going to be tough to secure a boutonniere to it. You’ll end up with your shirt sitting funny because the boutonniere is weighing it down, and the pins can make noticeable holes in the fabric. We are a big fan of grooms wearing shoes on the beach with their suits, even if the bride is barefoot. If you are wearing a suit it just looks like something is missing if you aren’t wearing shoes! 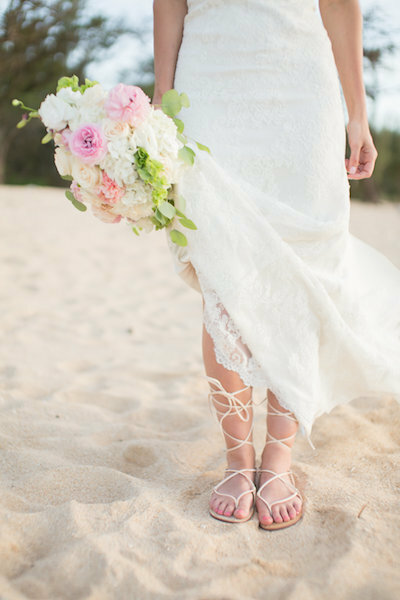 You can always remove your shoes for a few photos at the beach with your toes in the water or sand, but it’s nice to have them on for your ceremony. Keep in mind this is just our opinion, but we get asked a lot, so if you’re curious that’s our vote! Now that you’re equipped with all these fresh beach wedding attire ideas, we’re confident you’re more than prepared to reach all your #trophyhusband goals 😉 Congratulations on your upcoming wedding!